DesignBUILD RAW 2017 was a congregation of innovative outdoor landscape design projects from budding industry experts within the academe. Held last May 3-5, the collaborative project invited students from the University of Sydney (USYD), the University of New South Wales (UNSW), and the University of Technology Sydney (UTS). UNSW took home the award for the best design of the DesignBUILD central hub space. The students - Maia Guppy-Hall, Kimberley Willis Mitchell, Jose Siccion and Amira Shammo - harnessed the sustainable properties of cardboard to achieve the critically acclaimed 'Faceted' design. The 'Faceted' team took a modular approach to design which emulated the form of sandstone, one of the most prominent elements of Sydney's landscape. According to Guppy-Hall, the team conceived the project in response to Innovation, one of the DesignBUILD pillars. She added, "Our design responds to the ways in which the materials, such as cardboard, can be used to emulate the appearance of sandstone in a modular and more engineered way. By doing so, we're using really common and recyclable materials in a way that's kind of diversified." 'Faceted' was inspired by the sandstone formation on the coastal line of the suburb of Barangaroo in Sydney. 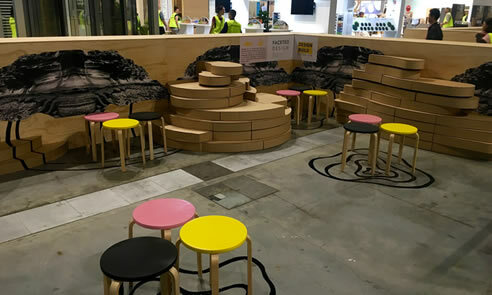 The students observed the Barangaroo landscape to further understand how sandstone can be modularly engineered and repurposed into design pieces that bear an uncanny resemblance to the face of the coastal line. The 'Faceted' team also found inspiration during a visit to an Aesop store along Flinders Street in Melbourne. This case study helped the students in polishing the cascading design of stacked cardboard as internal walls shaped like sandstone, rock and the curvature of naturally occurring cliff faces. Fusing the essence of both case studies, the 'Faceted' team was able to create installation pieces mimicking cliff faces with the inherent curvature of sandstone. The design project completed the aesthetic with natural earthy tones to be colour-appropriate to Sydney's topography. Mitchell explained, "We've poured that together in the design with contour lines on the floor that are meant to mimic a Sydney landscape and a graphic banner on the interior walls of sandstone cliffs [from Australia]." Apart from the visual aspect, the 'Faceted' design would not be a worthy alternative to sandstone without achieving structural integrity. Siccion explained that the team employed a stacking method for the cardboard to imitate the cliffside of Sydney, which "alone gave its natural structural integrity, as the mass is big enough to hold on its own, rather than having some kind of frame behind it." The 'Faceted' design is a beaming example of the many possibilities that can be achieved to integrate sustainability in the built environment. In the same vein, the project showed the booming potential of future industry professionals within the academe. Using a highly recyclable everyday material like cardboard, the students were able to beautifully lay out an innovative and comprehensive design with expertise, conscious, and teamwork. As students, the 'Faceted' team are excited to see "green architecture that incorporates planting naturally into the infrastructure and wedges itself within the landscape." Through DesignBUILD RAW, the students will surely inspire more sustainable outdoor landscape design projects from the academe. 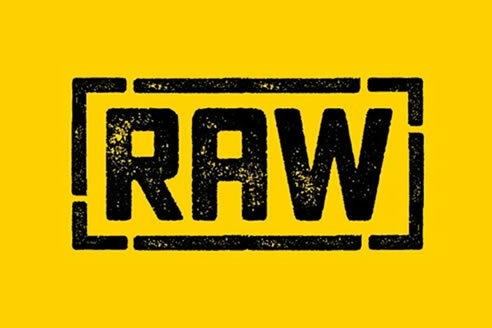 DesignBUILD RAW is returning to Melbourne this year! Keep posted for more updates on DesignBUILD Expo 2018, happening on May 2-4, 2018 at the Melbourne Convention & Exhibition Centre. Go to www.designbuildexpo.com.au now.